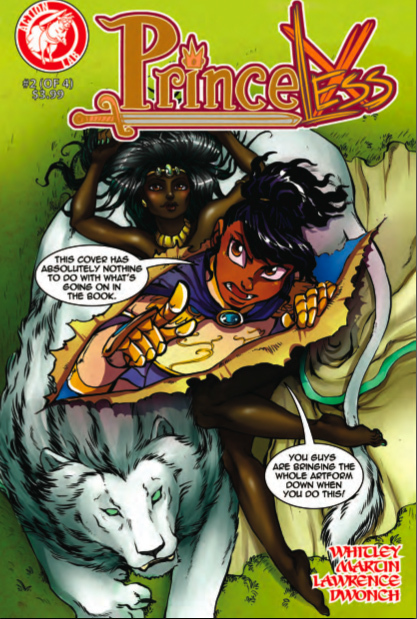 Oh way back in the day we took a look at Princeless and thought it was a downright awesome comic book. Volume 2 of the story line is just as amazingly cool as we thought the first series was. The first series reviews are right here on this tag line and written by one of our coolest writers Ted Brown. Remind me that if you are a dwarf girl and you wake up with a full beard and mustache, that using a sword is a perfectly fine way of shaving in the morning. Oh and remind me that if your sister ends up being the muse of an arts colony that there has to be some saving her involved as well. Climbing towers, killing wild animals, hunting people down, and visiting family, it is all in here. This has ended up being just a cute little series that is pretty safe for kids. If your kids need a comic book, you can do much worst than this fantasy fairy tale series. Overall this is a nice sweet little comic book that is easy to read with bright vibrant coloring that is going to totally appeal to kids. Adults will find it funny as well, making this a great comic for family reading nights as well. Kids are going to immediately dive into this story line and find it funny. Heck I found it funny and I am loosely termed an adult in this society. Nothing beats a good clean family fun comic book. This is one of those comics that I am going to rate five of five stars mostly because it is downright funny in places, improbable in others, and you can skip over some of the hunting parts. The best part is the dwarf girl and the muse story line while the evil king is up to being comically evil. Worth finding and purchasing if you are getting ready to go on a trip with the kids and the batteries are running short on the electronics. It would be good for kids to learn to read on paper, it is a skill that should not go out of style. Worth it, so totally worth it for comedy alone.